Easter baskets don’t have to be full of chocolate and peeps. Here are some great ideas that will fill your Easter basket without all the extra fat and sugar. What child doesn’t love to blow bubbles? Grab a couple of bottles of bubbles for this year’s Easter basket. 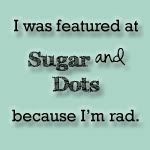 The kids will have a blast with them and with a little luck it will be warm enough outside to keep them busy and running around chasing bubbles for quite some time. Another fun treat is sidewalk chalk. This is the perfect time to draw on the sidewalk with the weather warming up. Plus we get enough rain in the spring that your driveway or sidewalk won’t be decorated for too long. Make some playdough using your favorite homemade playdough recipe (we have one at kinderinfo.com). Get a couple of small playdough toys to go along with it and let the fun begin. You can also pick up some very inexpensive toys at the dollar store. I have found anything from Easter themed coloring books to kites in there. This is also a great place to shop for the Easter baskets themselves, as well as some plastic Easter eggs that are great for hiding small trinkets and treats. Of course every child should have some special treats in the Easter basket as well. Along with the obligatory chocolate bunny, include some healthier treats. Both chocolate and yogurt covered raisins look like little mini Easter eggs and are a yummy treat. Fill a small cellophane bag with these sweet treats and tie a pretty bow around it. Mix some low sugar cereal like Chex, or Cherios with some small pretzels, peanuts, raisins, and some jellybeans for an Easter inspired Trail Mix. You don’t have to feel bad about your kids filling up on this. Pour your trail mix in a small bag, or fill some large plastic Easter eggs with the mix. Easter baskets aren't always for kids and you may need to think outside the basket for fun fillers for older recipients-- like teenage kids or adult family members. Think beyond packaged candy to the possibility of fresh fruit, a few pieces of organic candy, travel accessories, gourmet coffee, loose teas or reusable shopping bags in spring colors. Easter Baskets Ideas: Traditionally, Easter baskets are made of wicker, have a handle and are filled with brightly colored cellophane. The same wicker basket year after year with the same candies does tend to get a little boring. Besides, we could do without that overdose of sugar. Try these different ideas this year and watch your child’s face light up! 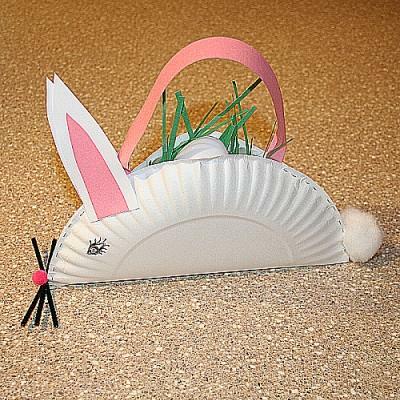 ■Paper Plate Easter Baskets:These paper plate baskets are very easy to make and only take a little time. 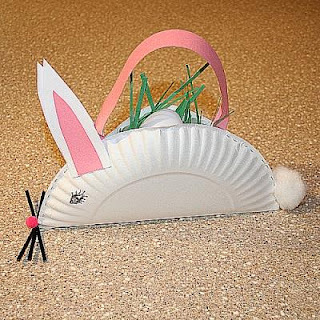 You can make a cute Easter basket by taking a paper plate and fold the paper plate in half and staple along the rounded edge of the folded plate. Leave about 4-inches along the top open to fill. Then take a bright color ribbon and staple it at the edge of the opening to make the handle. From card-stock or construction paper make the ears and glue them on. Draw the eyes with a marker or glue on eyes available in craft stores. Add some cotton for a bushy tail and black wool thread for whiskers, and you have a cute bunny basket all ready for treats for the little one. ■Spring Easter Basket:This spring Easter basket idea is an impressive way to keep the Easter basket tradition rolling. 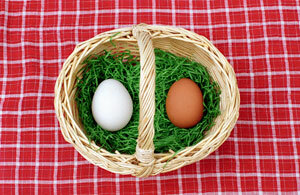 You can make these baskets by using wheat grass in your Easter baskets or in your spring decorations. Plan on planting it this weekend or early next week so it will be lush and tall and super green for the big day. Then you can add eggs, cookies, candies and nice personalized gifts to it. Click here for more details. ■Laundry Easter basket: Small laundry baskets make the perfect Easter basket for boys and girls. Whatever shape it may be, from round to square to rectangular, these work great. The baskets can be painted with a paint marker in Easter colors. You can also use glittery Easter stickers to decorate. Then add all the Basket fillings inside. Once the basket is empty, the kids can use it as a laundry hamper or a place to hold their toys. ■Plastic Wagon Toy Easter baskets:You can find Plastic wagon toys in the toy department. The benefit of making these wagon Easter basket is, they are not usually costly and can hold loads of goodies. You can stuff in coloring books, an Easter bunny, chocolates, candies..etc. When the goodies are gone, the child can cart his/her toys around in the wagon. ■Easter Gardening Baskets: Another great idea is to make a gardening theme Easter basket. You can make these baskets one per family. Take a flower pot and fill it with packets of seeds, potting soil, drainage rocks, gardening gloves and instructions for planting spring flowers. You can also include gloves, sun hats for the babies etc. if the family has kids. ■Make- Up Easter Baskets:To impress the girls at your party, try making cute make-up Easter baskets. You can take a nice hat and staple pink ribbons to its sides to make it a basket handle. Then add a make-up container filled with sample-sized cosmetics or other make-up items. You could also include a personal popcorn bowl with packets of gourmet popcorn or a new purse with a little cash inside. ■Make a Family Easter Baskets: Make an Easter basket with a little something for everyone in the family. Like special flavors of popcorn for the adults and little trinkets for the children. You could gift them to friends and neighbors, or use them as favors for your Easter Party. ■Making an Easter Basket with a Traditional Taste: Why not give your kids an Easter basket with a customary touch. Take a wicker basket and then decorate it with ribbons. You can take nice pink and blue color ribbons and weave them onto the basket. Cover the basket’s handle with the ribbon, and you could also attach a bow to both the sides of the handle. Then add some artificial green grass and chicks to it. Place some meaningful things inside the basket like a small photo frame, special candy, etc. Place a card in the basket wishing a Happy Easter and mention the meaning of the things you have placed in the basket. ■Plastic eggs filled with jelly beans or small plastic toys, such as fake bugs or tiny dinosaurs. ■Homemade candy and treats, such as homemade frosted Easter cookies individually wrapped. ■Remember that adolescents and teenagers might appreciate easter baskets with little cash inside. above. He and all of these men are on the juice. Also, he has nothing else to perform all working day but lift. 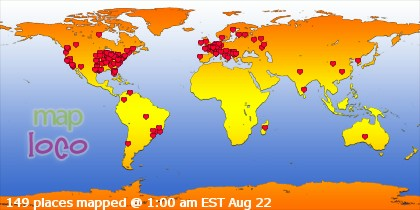 all the usefull info necessary. I concur, there is a expense to that processed food your wellness. You will get everything you pay for.